The island of Bali is part of a larger group, called the Lesser Sunda Indonesian islands and lies just 3 km east of Java island. Located close to the equator in the waters of the Indian Ocean. The landscape of Bali is a mix of mountains, valleys with lush vegetation and exotic coral reefs and the land is marked by innumerable temples. Not surprisingly people called Bali "Island of a thousand temples". Temples on the island are over 2000, most of which are decorated with traditional Eastern symbols and guarded by mythological creatures. In practice, consideration of all the temples of Bali is impossible, unless you stay in this exotic paradise with a rich culture, traditions, festivals for years. When a person decides to introduce at least a fraction of the temples of Bali is better to hire a local guide. They are everywhere and will ensure you and your companions hear the interesting stories about the sanctuaries. Bali is also known as "Island of the Gods". Visitors here should strictly comply with the rules previously established not to incur the wrath of local or gods. About 94% of the population professes Hinduism, there are many Muslims, not the least here are the people who worship at the pagan cult. About Bali it is said that it has more temples than houses. In every village on the island can see at least a few unique in nature sanctuaries that the local language calls "Pura". Pura means "a place surrounded by walls”. In addition, every home here on the island has its own small temple. temples of Bali are specifically oriented to the sea and mountains. Most of the buildings can boast ornate, beautiful carvings and many "gateways". Apart from that, at least several statues keep any sanctuary and temple safe. According to Balinese tradition the temples are a special place of encounter between humans and gods. During the many festivals on the island each Pura is richly decorated to appease the gods. There are rural churches, family churches, temples of rice fields, temples and other livestock. 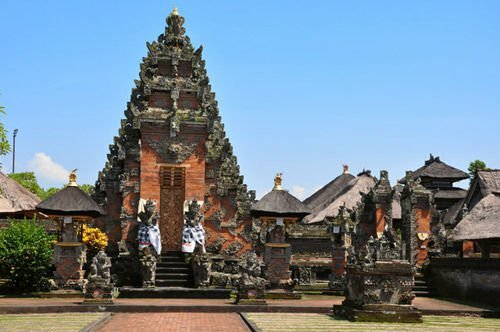 9 Pura temples of Bali, are the four cardinal points. According to the Balinese they protect the island from evil spirits. These are: Pura Besakih (center) on the western slopes of Gunung Agung in East Bali, Pura Goa Lawah (southeast) on the main road near Padang Bai in eastern Bali Pura Lempuyang (east) on the slopes of Gunung Lempuyang end Amlapura in eastern Bali, Pura Luhur Batukaru (west) on the southern slopes of Gunung Batukaru in central Bali, Pura Luhur Uluwatu (southwest) along the western edge of the peninsula Bukit, Pura Masceti (South) on the south coast near Ketewel, Pura Pasar Agung (northeast) on the southern slopes of Gunung Agung in East Bali , Pura Ulun Danu Bratan (northwest) in the Central highland Bedugal part Pura Ulun Danu Batur (north), built in Kintamani, the eastern highland part. These are just a fraction of Puras on the island. Among them the greatest interest of tourists is enjoyed by Pura Luhur Uluwatu, where there are performances of ritual dances and the like, and Pura Besakih. Pura Beji in northern part of Bali hand is dedicated to Dewi Sri - the goddess of rice and fertility. Deserving more attention, is Pura Kehen Bangui in the city, which is one of the oldest among the islands of Bali . Pura Taman Ayun, located in the city Mengvi marks lands of the Supreme God. Uluwatu sanctuary is dedicated to the god of water and is built on a 100-foot cliff above the sea. Goa Gajah Temple dates from the 11th century, famous as the elephant cave, because it is built in a cave in which there is a statue of an elephant. As a rule, every village in Bali has 3 main temples which are: Pura Puseh (Temple of the founders of the village), Pura Desa (village temple) and Pura Dalem (Temple of the Dead). In the temples of Bali are carried out daily prayers, funerals, celebrations, ceremonies of the village, etc. Access to tourists in some temples is allowed as long as you are wearing a dress with traditional robes and belt and observe all rules of conduct in the temple.